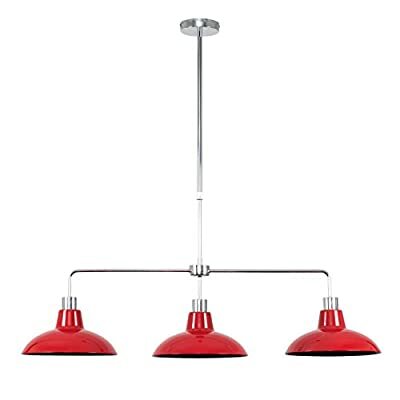 The Light Store are pleased to present this Modern 3 Way Polished Chrome Rise & Fall Suspended Over Table Ceiling Light. Check out the ratings and read reviews to see what customers are saying about the Modern 3 Way Polished Chrome Rise & Fall Suspended Over Table Ceiling Light. Modern increase and fall suspension 3 way over table ceiling light fitting in a polished chrome finish. This modern light fitting is guaranteed to be the focal point of any space. Total with 3 x curved shaped ceiling light tones. Ceiling lights are typically the primary source of brightening a room. The best fitting can make a genuine design declaration and complete your living space appearance. Gloss Black Metal Curved Shades. Ideal for Over Tables, Breakfast Bars, Kitchen Islands and More!